The BJP and the Shiv Sena, though officially allies, have had an uneasy relationship for months now. Mumbai: The Bharatiya Janata Party (BJP) and the Shiv Sena are believed to have sealed a seat-sharing deal for Lok Sabha and Maharashtra assembly elections due this year. The contours of the pre-poll alliance are expected to be announced Monday evening by BJP national president Amit Shah and Shiv Sena chief Uddhav Thackeray at a joint press conference at 6.30 pm Monday. Maharashtra Chief Minister Devendra Fadnavis and BJP state president Raosaheb Danve will also be part of the press conference, which will be held at Blue Sea Banquets at Mumbai’s Worli sea face. 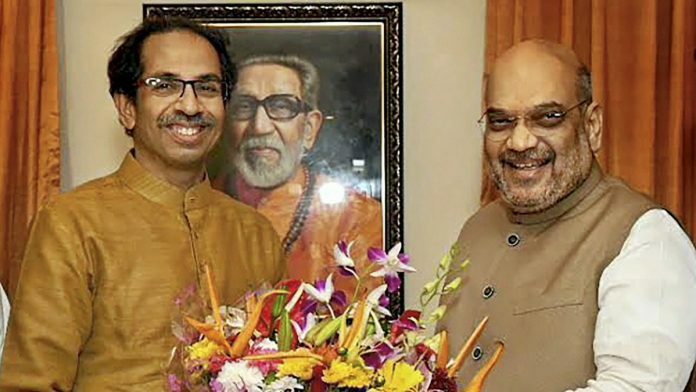 “BJP president Amit Shah will visit Uddhav saheb at his residence, Matoshree, to discuss the alliance, following which both will address a joint press conference,” Sanjay Raut, senior Shiv Sena leader and Rajya Sabha MP, told ThePrint. He added that all talks and conditions had been finalised. Also read: Can Uddhav Thackeray afford to go solo or is he just trying to bargain hard with BJP? The report marks a rapprochement between the two warring partners, who seemed to be on the brink of a split last year after the Shiv Sena, the BJP’s oldest partner, passed an official party resolution to contest all elections on its own strength — something Thackeray and the party’s senior leaders have reiterated at several rallies since. According to multiple party sources, the Shiv Sena had expressed a willingness to form an alliance for the Lok Sabha polls, but only on the condition that the party was given an upper hand in seat-sharing talks for the Maharashtra assembly election. The Shiv Sena is also said to have staked claim to chief ministership. According to a senior Shiv Sena leader, the parties are likely to have agreed on a 50-50 seat-sharing formula for the 288-member Maharashtra assembly. It was differences over seat-sharing that led the two parties to contest the Maharashtra 2014 assembly election solo. Until then, the Shiv Sena had always been the older brother in the alliance in Maharashtra. However, the tables turned in 2014, when the BJP won 123 of the state’s 288 seats against the Shiv Sena’s 63. The Sena ultimately joined the BJP-led state government as a junior partner, citing the need for a stable government, but constantly played the role of an opposition. Despite being an ally and a National Democratic Alliance (NDA) constituent, the Shiv Sena has been one of the harshest critics of the BJP-led governments at the Centre and the state. BJP president Shah first met Thackeray regarding the alliance in June last year, when he is said to have extended an olive branch to the sulking Sena and suggested that the two parties work out a favourable formula for the polls. The two leaders are said to have had several rounds of discussions over the phone. Last week, CM Fadnavis visited the Thackeray residence to discuss the alliance and told mediapersons that the meeting had been “positive”. A saffron alliance is likely to boost the prospects of both parties in Maharashtra, with the Congress and the Nationalist Congress Party (NCP) working out a partnership as well and trying to get several smaller parties on board.